Since the release of FTL, I’ve made some upgrades to the studio setup I wrote about a while back. For the sake of completeness, here are the details on the new setup. Check out the original article first, then read this for the updated stuff. My PC is a Windows 7 machine I built myself. I’ve always built my own desktop PCs and I get a lot of enjoyment out of it. Here’s the exact hardware, because I know someone is going to ask. Slap a powerful video card in here and you’ve got yourself a beefy gaming rig. Heatsink – Cooler Master Hyper 212 plus – I love this thing because the fan is huge and quiet. Be sure to tell your motherboard that it’s okay for this to spin at speeds lower than 600rpm, otherwise it’ll freak out. HDD – Two 1TB Seagate Barracudas – Many will tell you that you need to get solid state drives, but honestly, this machine I’ve built is so freaking fast I can’t imagine an upgrade would make a noticeable difference for me. Video – MSI Radeon HD 6570 – No need for a fancy video card. This thing was dirt cheap. Case – Fractal Design R4 – This thing has foam padding in order to keep the whole thing quiet. I honestly can’t really tell if it’s working or not. The system runs fairly quiet, but not completely silent. The monitor is one I got from a friend and I can’t even remember the make. Ultimately unimportant for my purposes. Get whatever monitor you want. Get two if you want tons of work space. Novation LaunchKey 49 – Solid hardware, good software support. I love it. I now have a plethora of sample instruments for Kontakt. Rather than go into detail on each one, I’ll just list my favorite developers. You already know about Native Instruments (native-instruments.com), here are some other great ones. 8Dio – These guys have a gigantic selection of professional-grade instruments. When I’m looking for new stuff, I always end up here first. Heavyocity – I own literally every product they’ve made. I think that should tell you enough. Impact Soundworks – Their selection isn’t as massive as some of the other providers, but the quality and usability of each instrument is arguably better than anyone else. Sound Iron – Closely related to 8Dio, these guys have a similarly high quality selection. I still use Cubase. 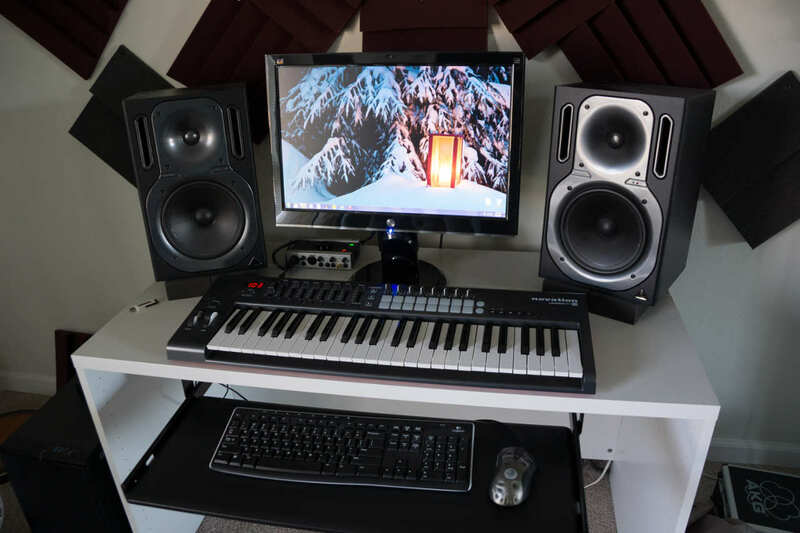 I still have the same Behringer studio monitors and the Komplete Audio 6 audio interface. If you have any other questions, please send me an email or talk to me on twitter (@benprunty).